The Professional Developers Conference 2008 is moving along quickly; it started big yesterday with the long awaited Azure Services Platform announcements (long awaited for me any ways). The slide below shows the set of services that make up the platform including "Microsoft CRM Online Services". There is some speculation about what this future offering is but why wait and speculate? 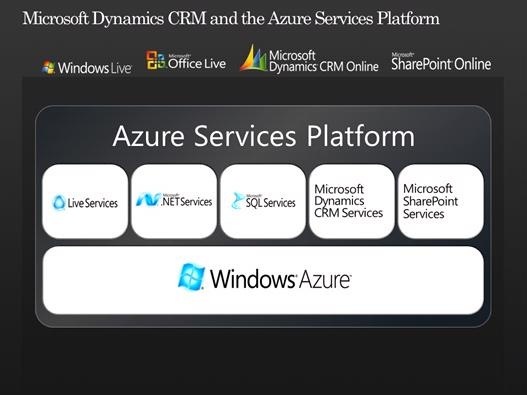 As Dave Thompson demonstrated during yesterday’s keynote, Microsoft Dynamics CRM is already available as a service and has a full set of tools that allow VARs and IT professionals to build high productivity, process aware business applications in an on demand environment. Of course if you’re reading this you probably already knew that. Humberto and David Shutt, respectively, gave presentations on customizing the client and on the move from a single tenant architecture to multi tenant. Tomorrow, Andy Bybee will do a session on building custom application logic (plug-ins and the like) and he’ll provide a peek at CRM 5. If you’re at the PDC don’t miss it.